David Axelrod writes that Obama and Jobs met to preview the original iPhone. 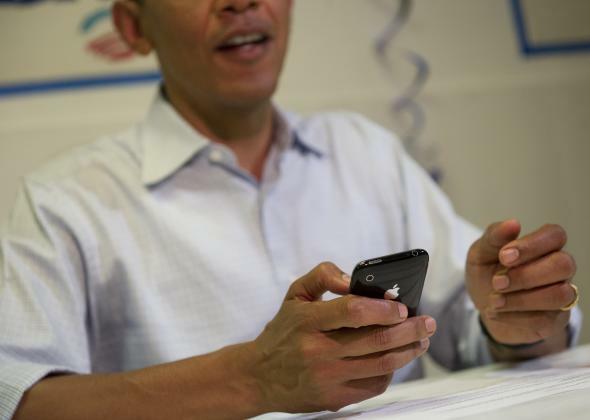 President Obama using an iPhone 3G or 3GS in 2012. President Obama has to use BlackBerrys for “security reasons,” but he has an iPad, and deep down he may be pining for an iPhone. David Axelrod’s new book Believer: My Forty Years in Politics, which comes out Tuesday, reveals that Steve Jobs met with Obama in 2007, while he was still a senator, to demo the original iPhone before it was available to the public. The perks of politics. As the Daily News reports, Obama loved it and saw its enormous potential. It even made him want to commit insider trading! “If it were legal, I would buy a boatload of Apple stock. This thing is going to be really big,” he reportedly said at the end of the meeting. For someone eyeing the presidency, it probably wasn’t a major temptation, but it’s kind of nice to know that he thought about it. Who wouldn’t?